Walt Disney Animation Studios and Emmy(R)-winning director Rich Moore (TV's "The Simpsons," "Futurama") take moviegoers on a hilarious, arcade-game-hopping journey in "Wreck-It Ralph." Ralph (voice of John C. Reilly, "Talladega Nights: The Ballad of Ricky Bobby," "Step Brothers") is tired of being overshadowed by Fix-It Felix (voice of Jack McBrayer, "30 Rock"), the "good guy" star of their game who always gets to save the day. But after decades doing the same thing andseeing all the glory go to Felix, Ralph decides he's tired of playing the role of a bad guy. He takes matters into his own massive hands and sets off on a game-hopping journey across the arcade through every generation of video games to prove he's got what it takes to be a hero. On his quest, he meets the tough-as-nails Sergeant Calhoun (voice of Jane Lynch, TV's "Glee") from the first-person action game Hero's Duty. But it's the feisty misfit Vanellope von Schweetz (voice of Sarah Silverman, "The Sarah Silverman Program") from the candy-coated cart racing game, Sugar Rush, whose world is threatened when Ralph accidentally unleashes a deadly enemy that threatens the entire arcade. Will Ralph realize his dream and save the day before it's too late? Finally a movie in a long while! Managed to catch Wreck it Ralph on Christmas day and I have to say it was an enjoyable movie (if you like animation and a simple sweet storyline). Usually most animated films are catered to children, but Wreck it Ralph is one of those animated movies that manages to make it an enjoyable for both children and adults alike with its solid mix of retro gaming nostalgia (Pacman! ), humorous adventure and a heartwarming story that would appeal to gamers and non-gamers. Knowledge of video games (e.g. Hero’s Duty, Pacman etc…) is not necessary to enjoy this movie, but if you do have (some) knowledge it is more entertaining when it comes to the some subtle (and some not-so-subtle) jokes that go on in the movie. Wreck it Ralph transports you into the digital world of the video game characters, who are free to travel to other games (just like traveling to a different state or city) when the arcade is closed at night. So when night falls and the arcade closes for the day, the game characters come to life and roam into the other games. As the title suggests, the movie is about Ralph who has the job of being the ‘bad’ guy in the game “Fix-it Felix”. Despite having a job as a ‘bad’ guy, the movie portrays such characters as good hearted characters who have come to accept their ‘job’ and are proud of being ‘bad’. All except Ralph, who starts to feel a sense of loss and dissatisfaction with the way he is treated in his game – he is feared, rejected and never invited to any of the parties. Ralph has a good working relationship with Felix, the protagonist of the game, but he starts to feel even more tired of being treated like a villain even after working hours. What sets Ralph (and the movie) off is the 30th anniversary of his game and he is literally ostracized by the whole game when they have a party to celebrate but fail to invite him. Wanting to be accepted, Ralph enters another game in an attempt to win a medal and be appreciated in his own game – all just to prove that ‘bad’ guys can be good too. It is just funny that all the ‘bad’ guys in the movie have a Bad-Anon support group with a slogan that they are happy being ‘bad’. So in his attempt to win a medal, Ralph ends up in the game "Hero’s Duty" where he sets off a whole chain of events just to get his medal. He gets his medal alright, but in the process of doing so, he accidentally activates a killer bug that becomes whatever it eats and lands up in a kid-friendly car-racing game called "Sugar Rush". 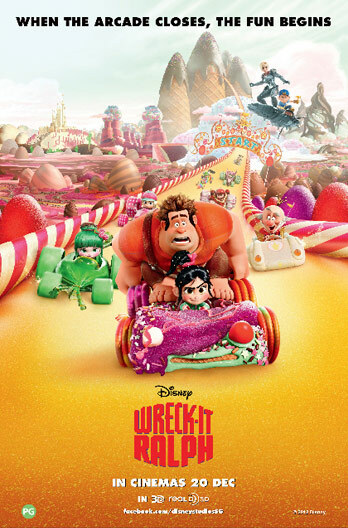 Thinking that the bug perished in a lake of liquid candy, Ralph ends up falling victim to the wiles of Vanellope von Schweetz, a 9-year-old racer outcast who is regarded as a glitch in the game. He is forced to help her win an upcoming competition in exchange for his precious medal. In the process of helping Vanellope, Ralph uncovers a big secret – the King in “Sugar Rush” is actually Turbo, a game character who had gone rouge and became a virus. Being the star of his car-racing fame, Turbo was jealous of a new car-racing game and in his jealous fit ended up ending his and the other game. Everyone thought that Turbo had perished, but he actually escaped into "Sugar Rush", became king (by erasing everyone’s memory and usurping Vanellope’s position) and lived out his racing dream, until Ralph came along. It turns out that Vanellope was the actual sovereign of “Sugar Rush” and the game would be re-set (put back in its rightful place) if she were to pass the finish line. When Turbo modified the code of the game and erased the memory of the citizens of "Sugar Rush", he made Vanellope’s special skill of teleporting a weakness of being a glitch that would jeopardize the game just so to prevent Vanellope from racing and crossing that finish line. While Ralph is busy helping Vanellope (which is a very sweet and enduring process), unbeknownst to him the bug that he brought along has already started to multiply rapidly and is a threat to "Sugar Rush". So together with Felix and Sergeant Tamora Jean Calhoun from “Hero’s Duty”, they try to save “Sugar Rush”. The interaction between Felix and Sergeant Tamora Jean Calhoun is adorably funny: they provide a humorous glimpse into the evolution of game design (from the pixilated Felix to a high definition Sergeant Tamora Jean Calhoun and their varied personalities, which deliver an adorable range of conflicts and humorous interactions. These two characters end up getting married to each other at the end of the movie. Ralph, being the protagonist of the movie, of course saves the day and comes to appreciate his job being the ‘bad’ guy. His working relation with the others in his game also improves and he becomes happier. The rapport between Ralph and Vanellope is simply adorable as the two who were rejected have not only found their rightful place and are happier, but they found a wonderful friend in each other. Overall, I would recommend this movie to those who just want to have good fun and entertainment. For a Disney movie, it is one of those few movies that actually have a satisfying ending that has just enough closure with the right mix of the happy, the sad and the funny.